If you try to go to Dayak Nation’s blog run by Cobbold John there is an unexpected page appearing instead of the blog. The blog must have been hacked-the work of parties who are unhappy with the critical views contained in the blog? Police refused to arrest protestors at Lawas blockade! 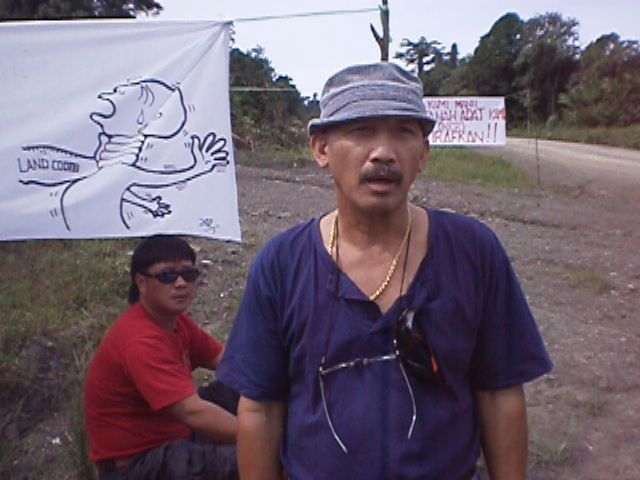 John Labo, member of the Lawas blockade against the Sabah Sarawak Gas Pipes Project, was called by police to `help in investigation’ this morning at around 10.45am, offered himself to be arrested if he had violated any law by organising the blockade.But his offer was refused by the police after half an hour of talk at the Lawas police station, much the same as what happened in Simunjan police station a week ago. In the latter event all the 200 residents admit their particiaption in the blockade and asked to be arrested along the 7 leaders who were. The police refused to put the entire villages under arrest-reflecting a trend of villagers’ increasing confidence in asserting their land rights and their awareness of the importance of the coming state elections. The police said they only want to ensure that there would not be any physical conflict in the blockade against the SSGP project mostly foreign workers. The blockaders stopped pulling a string across the road and choosed to stand across the road to stop only workers trucked in by the contractor of Petronas on every morning. So far the workers just turn back when they are blocked by the residents. BINTULU: Residents of Sungai Asap, Belaga Resettlement Scheme expressed unhappiness and disappointment over the non-payment of compensation promised to them for giving way to the construction of Bakun Dam. HERE IT IS: Duren (left) and Lating show the official letter that will be sent to the Kapit Resident.